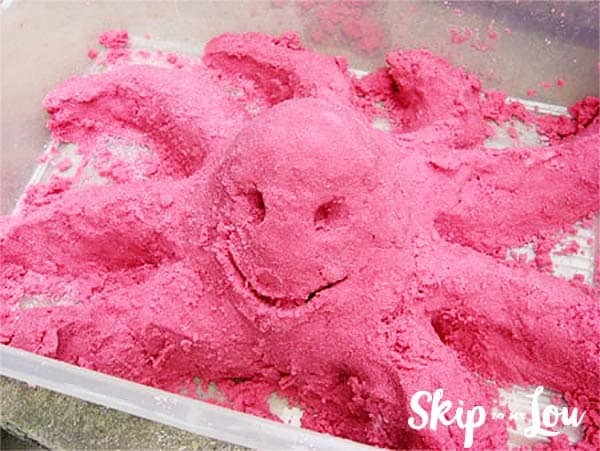 Home » Make » The most fun DIY Moon Sand make it at home! The most fun DIY Moon Sand make it at home! My daughter and I went on a hunt through the toy aisles for Moon Sand this week (thanks to the power of those very persuasive toy commercials!) If you haven’t seen the commercials, Moon Sand is that cool kinetic sand that you see in all the stores. We decided that it would be a fun activity to keep us busy this summer, and perhaps a different spin from the play dough that we love. 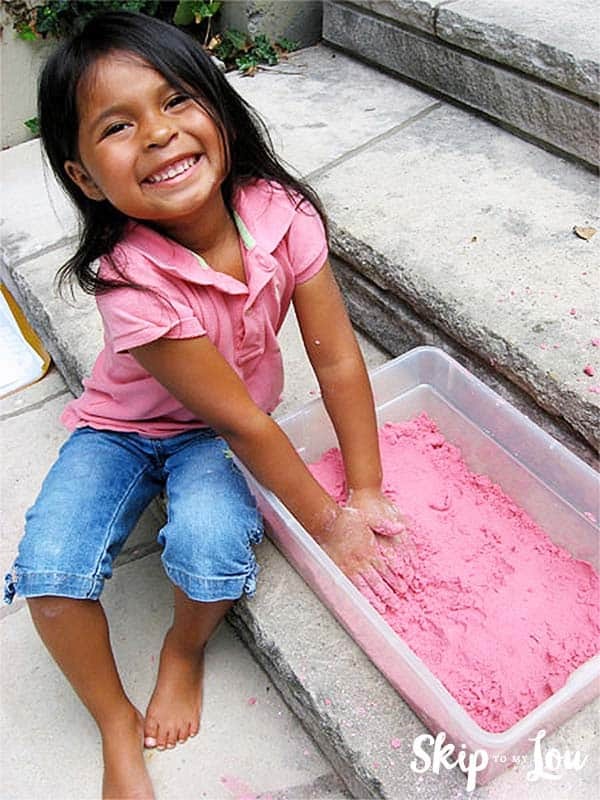 (Here is a great homemade play dough recipe) She was so excited to find the little box of Moon Sand, and I was a little shocked to see the price of said little box of Moon Sand. It didn’t seem like very much product for the price! With a quick search on google, I skillfully steered my daughter out of the toy aisle and into the grocery section. Did you know that you can make your own Moon Sand? Only three ingredients and you can mix up hours of fun. I decided that this experiment would be worth a try! To accomplish this money-saving experiment, I had to figure out just what exactly kinetic sand is. I learned that it is considered a three-dimensional building toy (perfect for sculpting and re-sculpting) and it is made of 98% sand and 2% polydimethylsiloxane (which is a type of silicone oil.) 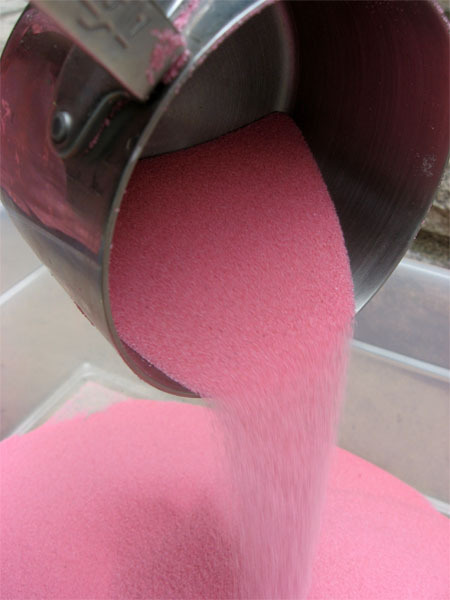 It mimics the physical properties of wet sand, which I know from experience, can keep a child busy for hours! Now to experiment with some easy recipes using ingredients that I can pronounce! 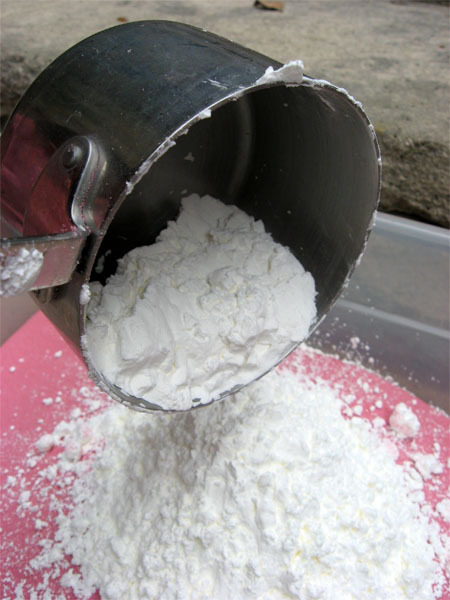 Mix together the sand and cornstarch. Add in about 2 1/4 cups water and stir. Continue adding the water until you have the desired consistency. You can experiment with the ingredient amounts until you get it exactly how you like it. 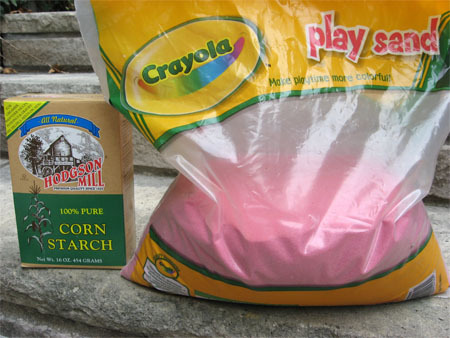 Mix 9 Cups of play sand with cornstarch. I spent a little extra money on the colored sand. It was a nice way to color the moon sand without having to use any food coloring or food dye. Then add in about 2 1/2 Cups water. Start with 2 1/4 cups and continue adding the water until you have the desired consistency. Mix well. I think that this is the fun part. This is such great sensory play for preschoolers! it would be a great addition to a preschool play area and it would also make a fun activity to do at a backyard birthday party. You can experiment with the ingredients until you get it exactly how you like it. Be careful though, it is very easy to get sandy oobleck! When finished playing, cover and store. Next time you play add a few tablespoons of water if it needs to be moistened. We stored it in a plastic tote, but I think that you could also store it in the gallon size plastic zip bags. The plastic tote makes for a great sensory bin. It isn’t exactly the perfect moon sand but it is close. The recipe make a lot more than the small box on the toy shelf and it is much cheaper. I have heard that you can add essential oils or kool aid packets to increase the sensory fun. Adding smell seems like a great option, but I haven’t tried it yet. 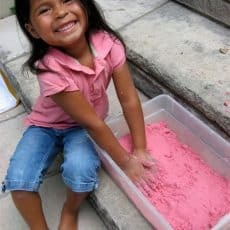 My kids had a great time and the kids loved the homemade moon sand (I found that even the real Moon Sand did not meet my kids expectations) Now you know how to make your own kinetic sand, and I hope that you and your kids will enjoy this fun experiment. I would love to hear your thoughts in the comments below, and if you try and add any smells, I would love to hear how they worked out for you! What a fun experiment and your daughter is just the cutest! Could you use decorative sand like what they use for unity ceremony's? I googled this on a different website for other ideas and one suggested adding 1TBSP + 1 tsp cream of tartar to help preserve it and help prevent molding. You can buy the fine sand at Michaels in lots of different colors too. Haven't checked the price of the sand at Michael's, but was suggested to buy the play sand at Home Depot or Lowes which sells it in 50lb bags for less than $10.00. Ohhh this is AWESOME!!! My son always wants them things from tv that I'm afraid to buy due to you never know what chemicals are in them. 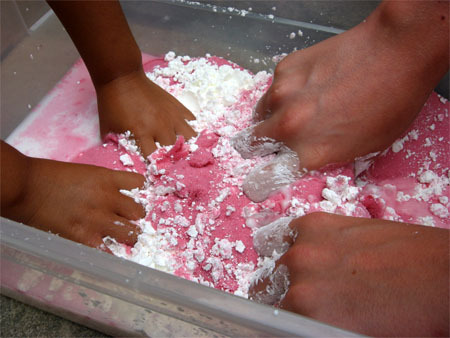 I love this play sand, corn starch and water!! you cannot beat that by any means! Thanks for sharing this I will be doing the same!! Made this to use with children I work with at the local elementary school. Maybe I did something wrong, but it didn't turn out good. When we made it, it was a perfect consistency, but every time I opened the container, there was liquid standing on top of the sand and the sand was drier than it needed to be. We would have to mix it up really well. Whenever we did play with it our hands were left with a white residue (I assume from the corn starch.) But, we were outside on the playground, so we couldn't wait to get inside and wash our hands. Maybe I will try again sometime. I made this recipe for my preschool classroom and while it works amazing, it stinks !!! Any one have the same problem ?? Help!!!! Does the water have to be a specific temperature? We used tap water in our moon sand. I think my recipe is a bit cheaper and you probably have everything in your kitchen. I made it a few years ago and just recently threw it away when it got wet. If you keep it on an air tight container it will save for a long time. Mix food color with oil first making it much darker than you want it to end up. In large bowel, combine oil and flour; mix thoroughly with your hands. If it’s to dry add 1 or 2T more oil (you can use this as a chance to add more color if needed. Keep it away from carpet and water and store it in an air tight container. Love this Jen, Thanks for sharing. We are going to give it a try for sure! Just tried this out with my kids. It was enjoyed but I discovered a fun error. Seems I added to much water and we ended up with "Alien Goo"...we use the green Crayola sand. The consistency was very odd, almost like Goop. Try it if you dare. Ugh! We were so excited to do this, and perhaps rushed a bit. Our sand was VERY moist from the store (same sand you used) and it was VERY humid out... so we have a watery, sloppy mess. I'll have to wait to evaporate some of the water off. :( Thanks for the recipe though! Hope we can save ours. Thank you so much for the idea!!! I'm definitely going to use it with my daycare kids!!!! This is such a great idea and my kids LOVED it. We made blue and it turned out perfect. So while this looks like a fun project, I don't think its much like "the real moon sand". On their website, it says that if you get water in it, to let it "dry out" on a paper towel and that after drying, moisture will return to it. Also above, someone said that when they returned to play with it, it was covered with mold! Thinking about this, it's no wonder. They actually use a corn-starch like substance for petri dishes! If you make the above, consider it disposable, throw away after a few days. It reminds me of the huge batches of "play dough" my mom made me as a kid. Fun in bulk, but didn't last long. Anyone have any idea on how they really make it? I make play dough in bulk from flour salt etc and it lasts a good month or more, but I store mine in the refrigerator. I would imagine the same is true with this recipe. If you're going to use ingredients found in your kitchen then it's not going to have the chemicals that keep the store bought stuff "fresh." For some that's fine, but for others who just want longevity, these DIY recipes aren't going to work. I have seen people attempt to make moon sand using slime which involves glue and borax. I haven't had much success in that department, but that might be the way to go. My kids are so going to LOVE this! Okay, yours is a seriously awesome blog! :) I'm so glad I found it this afternoon (was doing a search on why my amish friendship bread starter doesn't freeze solid!)!!!!!!!!!!!!! 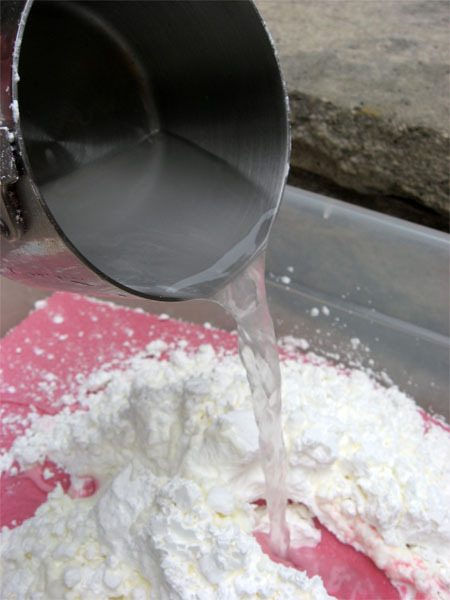 I am definitely going to try making gak and oobleck :) Is there a way to make gak using non animal-based glue do you know? I'll have to check that out!! I don't have kids but I'm sure my husband and I will be fascinated by this stuff anyway :) Great tote tutorial too!!! That is so neat! I am saving that for the recipe files for sure. My kids love moon sand. But it is expensive for the amount of sand you need. I have tried making my own moonsand in the past. After storing it for a couple of weeks, it was covered in mold. We may not have played with it enough and let it air out, but it was really gross. Just an FYI. I told you on Twitter that I loved this idea. And then we tried it! My 5 year old son loves it! The only issues - I was being so frugal that 1) we used sandbox sand...too grainy and 2) I let them put food coloring in to make it pretty. ha!! My son's hands were bright green for two days! Seriously - thanks for a fun project! This DIY project looks like tons of fun! Before this post I had no idea anyone could make this. NIIIIIIIICE!!!!!!!!! My kids go through this stuff like crazy. Thanks so much! I think I like your idea of a container best of all! We have some of the moon sand and have no idea how to drag it out without having the kids take it from one end of the house to the other (or dumping it all). That's a great idea...we are celebrating 7/20, Neil Armstrong landing on the moon and this will be great. I saw this recipe on a money saver site and it looked fun, glad to see someone that has actually tried it. Keep up the good work. Cool! I have got to try this! Thanks so much! This looks fun, my daughter is always wanting me to buy this for her. We homeschool, so this looks like a fun project to try. One question, does it try up after time? How long does it typically keep? Thanks again for another great tute! Totally cool, we've never played with real moon sand, but this looks like a lo t of fun. We'll have to try it! Thanks for sharing! thank you soooo much! I love this and the color is awesome! Very cool, and very timely too! Did you know that this upcoming Monday 7/20 is the 40th anniversary of Neil Armstrong landing on the moon? I'm making "moon pies" to celebrate, but will now have to make up a batch of moon-sand!! Thanks a bunch!! Awesome! I didn't know about the play sand! What a great idea! My daughter would love this. I'll have to give it a try! Thanks! That is awesome. I will definitely be doing this with my kids. THanks you so much for the recipe! this looks wonderful!!! i teach preschool and will save this one for sure!